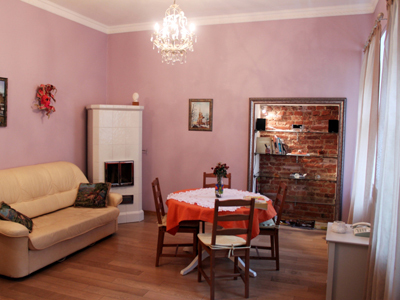 Apartment is located in the very touristic center of St.Petersburg. There are 2 rooms in apartment, bedroom is separated, and living room is joined to the kitchen. There is king-sized bed in bedroom and folding sofa in livingroom. Apartment is fully equipped with all necessary technique: electric kettle, coffee machine, refrigerator, iron, hair dryer, music center and TV. There are a lot of sights near the apartment: Letniy Garden, Mihailovskiy palace and garden, Marsovo field etc.